No doubt 3D has revolutionized the cinema experience. Since Avatar (the good one, not the M. Night Shyamalan train wreck) was released in 2009, 3D has come back to movies in a very big way. Every week, a new 3D movie hits the box office. What does all this mean for the future of 3D projectors and home theater? 3D movies may have been around since the early 1900s, but 3D-ready home theater projectors didn't enter the market until 2008. And those were designed mainly for educational purposes. Think of how cool 11th grade geometry would have been if you could have seen parallelograms and isosceles triangles rotated in the third dimension. These early model 3D projectors were only 720p, and since they didn't have an HDMI input, could only receive content from a PC through a VGA or DVI cable, reducing the image quality to an acceptable, but not great, 480i. But then everything changed in 2010 with the release of the LG CF3D, the first 1080p 3D projector for home theater. The LG CF3D was the first 1080p 3D projector with HDMI inputs (three total! ), meaning it could process signals from 3D-ready Blu-rays and the PS3. The LG CF3D 3D projector could also handle multiple 3D formats, including frame sequential, side-by-side and checker board. 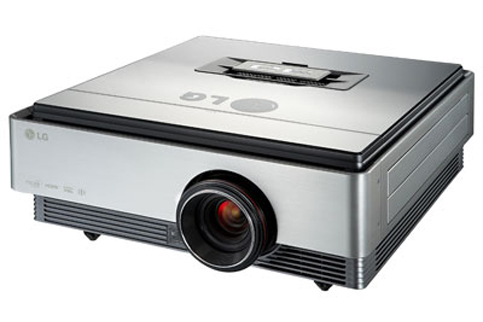 Since 2011, we've seen host of new HD 3D projectors, including projectors that can convert 2D content to 3D. Results vary from meh to pretty ok, depending on what's actually being projected, but from our experience, native 3D content will always look better. To "see" in 3D, a slightly different image must be delivered to each eye. This is traditionally done with special glasses. To your brain, these ever-so-similar overlapping images create the illusion of depth. Anaglyph images and glasses are the most basic way to deliver a 3D effect. Chances are everyone has seen the red and blue glasses made popular during earlier attempts at a 3D revival. These work by filtering an image composed of two almost identical superimposed color layers. Anaglyph technology is still used today and will work with the correct content and any TV or projector. However, it provides the poorest 3D image quality. Many of today's cinematic 3D experiences are delivered via polarizing systems. These send the projector's light through polarizing filters that force the light waves to oscillate in two different directions, one intended for the left eye, the other for the right. A special polarization preserving screen is required. Filters on the glasses allow the lenses to passively pick up the light (read: image) meant for each eye. The brain combines the two images and tada! 3D. Color is improved and cross-talk (when one eye picks up an image meant for the other) is virtually eliminated with the polarizing method compared to anaglyph. However, the image's brightness is greatly reduced since each eye only picks up half the light from the screen. Some theaters use two separately polarized projectors to compensate for this. As of the release of this article, all the 3D-ready projectors available in the commercial and residential market use active shutter glasses to deliver the third dimension. This will likely remain the standard for all 3D DLP projectors in the future. With active shutter glasses, cross-talk is nearly impossible. However, the image is significantly dimmer than its 2D counterpart. Fortunately, projectors have been getting brighter over the last few years so this is not as big an issue as it used to be. For active 3D, we recommend a projector with at least 2,000 lumens. So far, all 3D DLP projectors use the DLPLink protocol to sync the glasses and the screen. We predict this setup, in which a white light is beamed from the projector to the screen to the glasses, will become the standard for 3D projection.